Since 2012, Hildreth has led a multi-university team exploring the programmatic and technical intricacies of knowledge preservation in science. The Data and Software Preservation for Open Science (DASPOS) team consists of physicists, computer scientists, and digital librarians from Notre Dame, University of Chicago, University of Illinois Urbana-Champaign, University of Nebraska-Lincoln, New York University, and the University of Washington. This multi-disciplinary effort is designed to explore the knowledge preservation needs of various disciplines and to construct a prototype data and software preservation architecture that can be used as a template for knowledge preservation efforts in different fields of science. 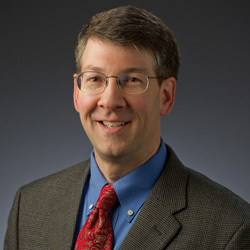 In addition to his work in data preservation, Hildreth is a member of the Compact Muon Solenoid (CMS) experiment at CERN’s Large Hadron Collider (LHC) in Geneva, Switzerland, where he and other high energy physicists from Notre Dame played key roles in the recent discovery of the Higgs boson. This group works on measuring Higgs properties, specifically the coupling of the Higgs boson to top quarks. Hildreth is also working on searches for new physics beyond the Standard Model of particle physics, specifically looking for new physics in final states involving high energy photons and, separately, high energy tau leptons. Originally published by Stephanie Healey at science.nd.edu on October 14, 2014.